The Urban Conservancy is working with Launch NOLA Green, Sustaining Our Urban Landscape (SOUL), Green Light New Orleans, Water Block, and the city’s Office of Resilience and Sustainability — as well as Hoffman Triangle residents, churches, schools and others — to improve the neighborhood’s stormwater conditions. “This event is part of a larger outreach effort aimed at understanding community needs, assets and growth opportunities” says Atianna Cordova, founder of Water Block and outreach manager for the project. At the Green Your Neighborhood event, Hoffman Triangle residents can learn about effective stormwater management techniques and resources to help reduce flooding on their properties and on their streets. 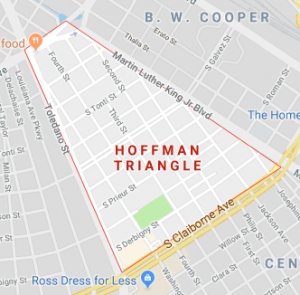 Hoffman Early Learning Center will hold a Beautification Day adjacent to the park in conjunction with the kickoff event, with tree and rain barrel installation by SOUL and Green Light New Orleans. Green Your Neighborhood features information food, music and activities for kids along with information about flood reduction. The event takes place from noon to 2 p.m. at Taylor Park, 2600 S. Roman St., with a rain location at the park’s basketball court. From 10 a.m. to noon, SOUL volunteers will plant trees along the fence line between Taylor Park playground and Hoffman Early Childhood Center. At noon, the Crocker College Prep Marching Band will kick things off in the park. The family-friendly activities in the park include a rain-barrel painting station with Green Light New Orleans. Funding for this project comes from the Southeast Sustainable Communities Fund, which is investing a total of $1,798,400 to support six sustainability projects in the Southeast. Projects are focused on implementing and scaling equitable solutions to the challenges associated with climate change with a focus on issues related to water or energy.